Erin French's new book, The Lost Kitchen, is a sensory joy. The 100 recipes are simple seasonal fare, creatively elevated and beautifully photographed. Each recipe seems to be have been conceived with such reverence for the ingredients, it's hard not to be inspired to make them all. Born and bred in Freedom, Maine, population 719, French sees food with her heart and her soul. The introductory chapter tells the story of how her cooking evolved, from making dinner for her father at 14 to preparing "secret suppers" in her own small apartment to opening a restaurant (also called the Lost Kitchen) below that apartment. French lost the original restaurant in her divorce, but, undeterred, she opened it again, this time in an Airstream trailer. She finally settled the Lost Kitchen in an old gristmill, now on the National Register of Historic Places, and French's story reads like a novel that becomes your favorite movie. Much like the magic of Maine, the recipes in The Lost Kitchen beckon you to keep returning for more. French understands that most ingredients will be readily accessible, and she encourages experimentation and offers substitutions for those that are not. She also notes that most culinary woes can be fixed with butter and salt, a theory I wholly stand behind. The chapters are divided by season, starting with spring, and then grouped into firsts, mains, and sweets. Recipes to try include applewood-grilled spring chicken, Maine halibut Nicoise, and roasted cauliflower with olives and red pepper flakes. Tempting desserts include grilled stone fruit with blue cheese and honey and a sweet nutmeg custard. There are interesting cocktails, like the rhubarb gin fizz, maple Manhattan, and blackberry basil mojito. Any one could be the signature drink for your next party. 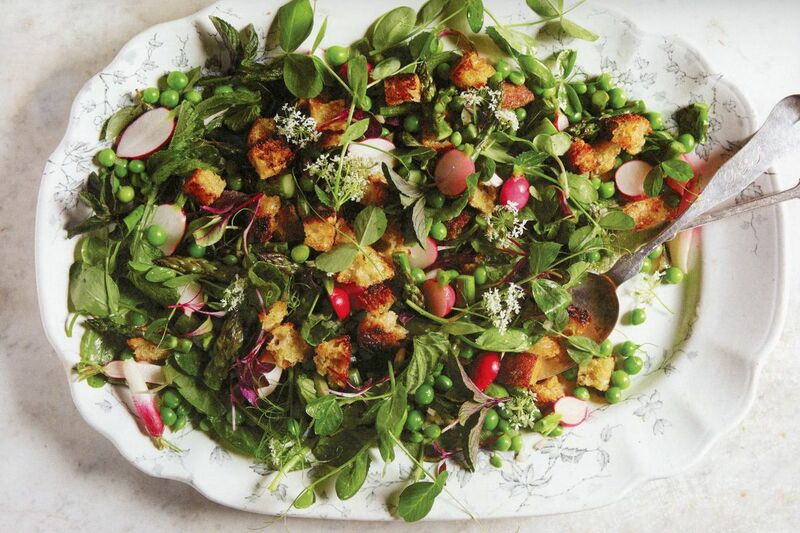 On a perfect spring evening, I made the simple bread salad, a stunning combination of barely roasted asparagus, fresh peas, pea shoots, and radishes, tossed with a shallot vinaigrette and torn bread, made delectable by browning in olive oil in a hot cast-iron pan. The salad is truly the best of all things; the essence of spring.